The third Ambient Online Themed Compilation is now available. There are 74 tracks on it (!) and two of them are by somebody named Starthief. I’ve only listened to a few of the others so far, but I like what I’m hearing. “Georgium Sidus” may be as close to conventional ambient music as I’ve come lately. “In Cyan” had to go weirder. Both of them are studies in tension, in their own ways. A couple of the pieces on the upcoming album are a little more chill, providing relief from the oppressiveness of a couple of the others. But maybe sometime I should just make an album of relaxing yoga music or something. It’s been 4 months since I set out my 2019 goals. How am I doing? Pretty well! I released The Rule of Beasts, submitted to the compilation above, and have recorded 42 minutes of music toward Passing Through. The latter was slowed a little by gear and layout changes but I think this is an acceptable pace. I haven’t done anything related to playing live. I looked into some ambient labels and haven’t decided to submit anything to them yet. I changed all my albums on BandCamp to pay-what-you-want. I booked a hotel for Knobcon (registration for the event itself has changed from “tickets on sale March 1” to “tickets on sale in March” with no indication of progress). Swimmingly! I’m basically at version 2.0 now (just waiting on one module to arrive from Portugal, and may make one more substitution), and it’s as good as I had hoped. I’ve been diligent about tracking money spent on gear and received in sales, and in fact have stuck to the stricter idea that I’m going to spend less than I sell. There’s still some leeway in that for a couple more toys if I want — though I will wait at least until KnobCon for that — but right now nothing’s really on the menu. Physically: I don’t see my endocrinologist in May, and have been measuring nothing. I’ve been generally eating healthier, I think. Mentally: really haven’t had the “maybe a panic attack” symptoms for a while. CBD oil is not a miracle cure but has helped with general mood stuff and seems to relieve tension a little bit. I have been pretty good about avoiding, or quickly disentangling from, pointless online bickering. I finally finished the vinyl plank floor. Haven’t done much else really. 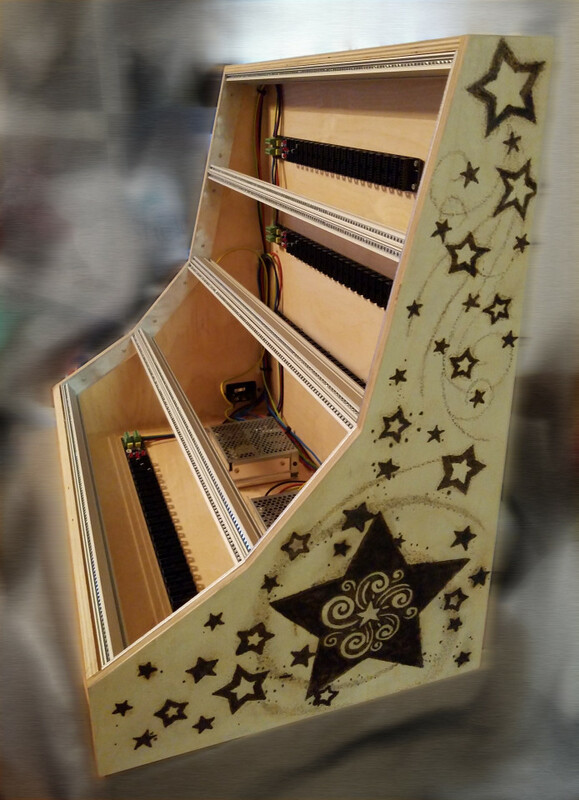 Last night my spouse finished pyrography on the new case, and I spent about 4 hours getting everything (except the FX pedals) installed, wired up and tested. The art takes some inspiration from a diagram of black hole evaporation, and some clipart and tattoo designs. But it also has more of a feeling of fantasy and whimsy and magic, and I like this combination a lot. 🙂 I’m really pleased at how this turned out and it was definitely worth waiting a couple of extra weeks for. I’m still waffling on the tattoo thing though. Maths replaced Function, Mini Slew, 321, and Pico A Logic. Sputnik 5-Step Voltage Source and Selector replace Mimetic Digitalis. I let go of Maze, Double Helix, G8 and the Monobius pedal. I added the 16n Faderbank, Volca Modular, Doepfer BBD and Erbe-Verb. Incoming: Xaoc Tallin is replacing ModDemix and DTA. Incoming: ADDAC200PI Pedal Integrator is replacing S.B.G. 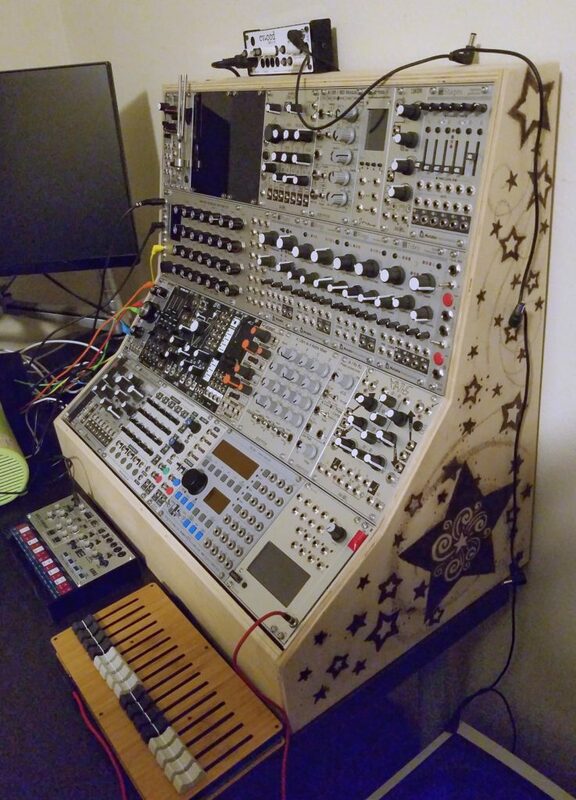 Overall that’s 21 modules and two pedals out, 9 modules and an awesome controller and a tiny standalone synth in. I feel like I expanded the system, but it’s smaller, less expensive, arranged better, and still has a little space to grow later on if I’m careful about power requirements. My esteemed spouse put in a noble effort toward the pyrography on my new case this weekend. There are still some hours more of work in it (lots of stippling! ), and things like rheumatoid arthritis pain, Captain Marvel, and a bit more complexity in the task than expected have slowed the process. In the interim I’ve done some thinking about the specifications for the power supplies in the case, vs. the listed consumption. Sparing you my limited-understanding description of Eurorack power supplies, my modules need close to 100% of capacity on the -12V rail and that’s not a good thing. Meanwhile the case can supply a ton more +5V current than it needs to, but apparently converting from +5 to -12 isn’t an easy matter. I may pop some USB power sockets into my case to grab some of that sweet +5V. My solution was going to be: try it, but keep my old add-on PSU (which I’d really prefer to sell) to run a couple of the hungrier modules if necessary. QPAS stands out as the most gluttonous by far (and rumor has it the listed specs are even a little lower than what it actually demands), but I like it and would prefer to hold on to it. Natural Gate is absolutely going to stay in this system no matter what, I don’t care how much power it might need. Crossfold is up there… oh hey, I have the ER-301 which can do wavefolding. My first attempt sounded good-ish but not good enough. My second attempt though — after reading some research on the subject — was much better and I feel confident in letting this go. Sputnik 5-Step is also pretty hungry — but I think I will hold onto it. Maths, the BBD, and the E370 are all significant, but fair compared to what they do for me. ModDemix needs a good bit of -12V, but I don’t tend to use it very much and can now easily duplicate what it does in the ER-301. DTA has unknown power specs, probably fairly mild but I don’t know for sure. I can replace both with a Xaoc Tallin, which has some nifty features and sweet overdrive should I want that, for modest power, space and cost savings. ALM S.B.G, the FX pedal interface, isn’t one of my favorites and also is a little greedier than options I like better. The ADDAC200PI seems ideal (and at 1/3 the power) but everyone is sold out — I wrote to the maker to see if it’s available at all. The Retro Mechanical Labs GPI seems an okay backup option. 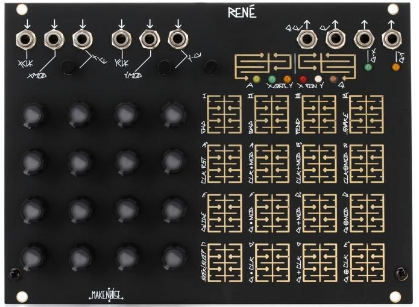 I also have a Make Noise Erbe-Verb arriving today. Broadly, it does for reverb what the Doepfer BBD does for delay — an experimental, open, slightly crazy thing. Normally reverb goes at the end to put a sound into a contextual space; this one can do that but can also generate sound itself, and/or be modulated in all sorts of alarming and dramatic ways. People are still discovering and sharing completely new uses for it and there’s even an entire EP made with nothing but Erbe-Verb, and I find that pretty exciting. Aside from maybe switching my Tides for a Xaoc Zadar and keeping an ear out for what u-he CVilization will have to offer, that’s the end of my planned gear changes. But I plan to attend KnobCon in September, which might lead to something. I also plan to upgrade my computer this year. It’s an 8 year old machine where literally everything but the motherboard, CPU and case have been replaced at least once; the case is not my favorite and the CPU is a first-generation Core i7. Moore’s Law died a few years back, but still a budget AMD Ryzen could eat it for breakfast. I’m just waiting on the third generation of Ryzen chips, rumored to be 15% faster, with more cores and less power consumption and coming in June, to make that change. Intel still leads them just a little on single-core performance, but costs about twice as much for the privilege. Whether I’ll go prebuilt, choose my own pieces using PC Part Picker, or somewhere in between with a barebones or customized gamer setup, I’m not sure. I wrote up a forum post in a “how to synthesize drones” thread which, I think, contains the most coherent thoughts I’ve put together on the subject. Maybe that’s not saying much, but here it is for posterity, expanded a little bit. I use the word “drone” in a more general sense than some people, but more strictly than others. If I control a sound in terms of level rather than “playing notes”, I generally consider it a drone. It’s not an absolute rule, but drones usually have a (more or less) fixed pitch. There may be rhythmic accents. I don’t quite understand how a band like Earth is considered “drone” when they’re clearly playing riffs, have melodies and standard chord progressions and so on. That’s far too loose a definition for me. Nor does it have to be an unrelenting, 25-minute long pure sine wave. Depth, width, power, distance, gentleness vs. forcefulness, cleanliness vs dirtiness, spectral balance, harmonic structure. Texture. Micro-structure, granularity, etc. This can come from FM or other (near-) audio rate modulation, the beating of inharmonic frequencies against each other, repeating delays, granular synthesis, timestretching, the content of any samples used, or other sources. It could be a “natural” and inherent part of the means of sound production, or it could be intentionally added modulation. As an example, the sound of the carrier of a dial-up modem is a steady beep, which I would categorize as having little or no texture, but when the actual signals modulate it, we can hear structure in it even if it’s too rapid for us to follow — that’s a kind of texture. The balance between stasis and change in the medium term. Perhaps it’s a weakness of mine, but I want some motion to take the place of discrete notes and melodies. That motion could be the result of random or periodic modulation (including rhythm), “natural” feedback processes, or manual (usually improvised) control. Form. That is, structural change over time on the “song” scale. Simply fading in, holding steady for some minutes, and fading out is usually unsatisfying, regardless of any meta-narrative about separating music from time, or a temporal window on an endless vibration. Changes in volume, timbre, adding or removing layers, changes in harmonic structure or spatial cues or background noise add interest even when they are not the defining feature of the piece. Usually I don’t plan form in advance, but set up opportunities for improvisation and then let the form flow naturally as I record. If that’s not effective enough, I will edit the recording to enhance or expand these structural changes, or reject the recording if I feel it just doesn’t say anything. I almost always set up at least two voices, because relative variations in level, spatial characteristics or timbre can be much more interesting than absolute variations of a single voice, and because they can lead to shifts in texture or the creation of new textures. Sometimes extra voices have their origin in the original voice, and just involve additional or different processing. Although I’m talking about drones here, this corresponds quite a lot to Curtis Roads’ concept of “multiscale composition.” As I’ve said before, my act of composition is spread out between pre-recording, recording and post-recording phases — but it’s all composition, even if there are no “notes”, some is spontaneous, and some a reaction. Why not use the ears as a tool of imagination, and not just the brain? I’ve shared this recording elsewhere, so why not here? Plaits in waveshaping mode (with an LFO over the level) feeds the audio input of Rings in inharmonic string mode, which feeds the ER-301. In ER-301 channel 1, three Schroeder allpass filters in a feedback loop are manually controlled by a 16n Faderbank. In channel 2 there’s just a grain delay in a feedback loop with its time manually controlled. There’s a bit of cross-feedback. The two channels are recorded as mid-side stereo, and some ValhallaRoom is applied. I’m really enjoying the 16n Faderbank as a controller for all sorts of things. In another recent recording, I used it to control levels in Maschine over USB MIDI, as well as the levels and timbre of a harmonic oscillator in the ER-301. In this one, constant manual micro-adjustments of the allpass filters prevented the feedback from building up into something piercing and unpleasant, and changes in harmonic content were a combination of tweaking Plaits and Rings as well as the filters. The impression I get from this piece is light refracting off the curved surface of some mysterious alien artifact, perhaps… which might have been better title inspiration than what I chose. Ah well. I’m reading A Study In Honor, a novel set during a near-future civil war. A post-Trump leftist government implements universal healthcare, guarantees LGBT rights, and does much for racial justice and income inequality and so on — and then radicalized right-wing idiots are so upset about it that some states start a war, and federal centrists are in the process of eroding rights and breaking the economy again to placate the crazies. Our protagonist is a wounded veteran of that war, a queer woman of color who suffers from PTSD, a poorly fitting, irritating, poorly functioning prosthetic arm that the VA won’t replace, and fresh waves of alienation. Needless to say, this has not been a happy story so far. It’s well-written and gripping, though. So with that bouncing around in my subconscious, last night the infamous Shitgibbon-in-Chief actually appeared in my dreams. This cartoonish con man has been a mental health threat to the entire country for the last 30 months or so, but up until now he’s avoided direct appearances in my brain at night. Well… he’s officially banished. I figured out what to do with those pesky pedals. Simply using a wire tie to strap a couple of composite shims to the back will let them sit vertically atop the modular case and prevent them from tipping over — assuming I push the back of the case up against the wall. We’ll see. Pyrography on the case isn’t underway quite yet, but there’s a heat transfer from a laser printer on it. I kind of like the looks of it as is, but there are sections not filled in (to conserve ink) and some guide lines that came through dark and muddy. So I’m willing to wait a bit more for actual pyrography. Those small speakers are not wonderful. They’re cheap and small and unobtrusive, but even for gaming I definitely hear the difference. Still, I’ll get used to it, and it’s not like the acoustic setup really did justice to the studio monitors I had. The length of delay in a BBD is determined by the number of stages (which is fixed on the chip) and the clock rate. Slower clock rates result in two or three kinds of signal degradation as well as an audible whine. For that reason, most BBD delays have heavy low-pass filtering and restricted clock rates, and only give “dark” echoes. For some musicians, just throwing an LPF onto a digital delay is a close enough approximation to get that kind of sound. But Doepfer’s BBD is special. To encourage experimentation, it eschews the filters and clock rate restrictions, and opens up the circuit to manipulate or synchronize to it. 1024 stages is ideal for flanging, and short enough to work for comb filtering and Karplus-Strong synthesis, but for actual echoes it needs a slow clock which adds a lot of dirt and whine. But there are software plugins that can surgically remove the whine while leaving the more interesting grunge, and without making the whole echo super-dark. Or I can insert a clean delay into the BBD’s feedback loop, extending the echo time while having full control over the sound character. Direct manipulation of the clock, and using the clock itself as an audio source, leads to all kinds of other places that you just can’t get outside of modular synthesis in general and this circuit design in particular. I decided it would make some sense to do some of my studio rearranging in advance of having the case ready: the scary part where I move the power and audio interface out of the desktop rack and into their 2U studio box, and hope I don’t break or lose anything, all the cables still reach, and everything works. …et voila. There’s no longer any “ceiling” to the desktop rack preventing stuff from falling in, and things are a little awkward for the moment. But aside from leaving the pedals disconnected for now, it’s all up and running. The Mantis is back on the desk instead of perched on the shelf, for the few more days until everything moves into the MDLRCASE. 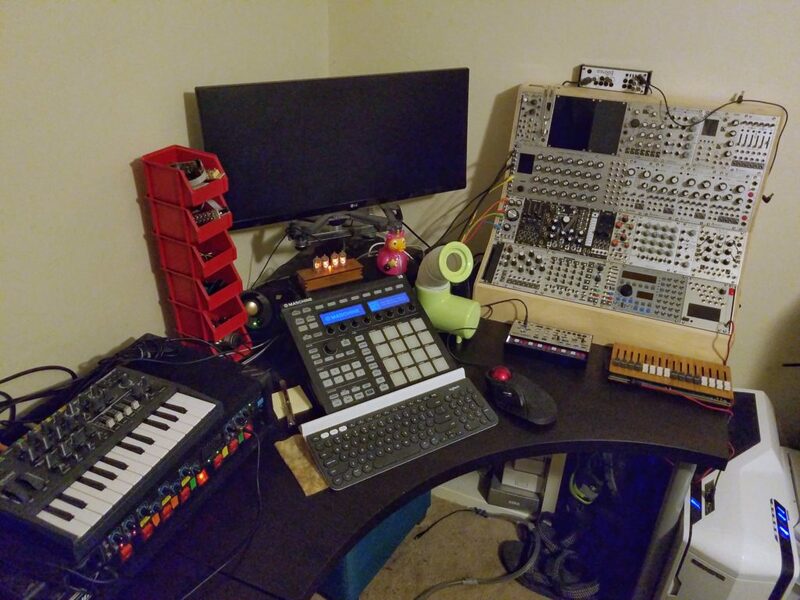 There’s not quite enough space in front of the 2U box for the Microbrute, though if I invested in some right-angle cables for its rear it’d be close-ish. So I think in the new configuration it’ll just stay atop that new box. That way there’s a couple square feet of space in front of the 2U box to use as an actual desk, or for small controllers etc. 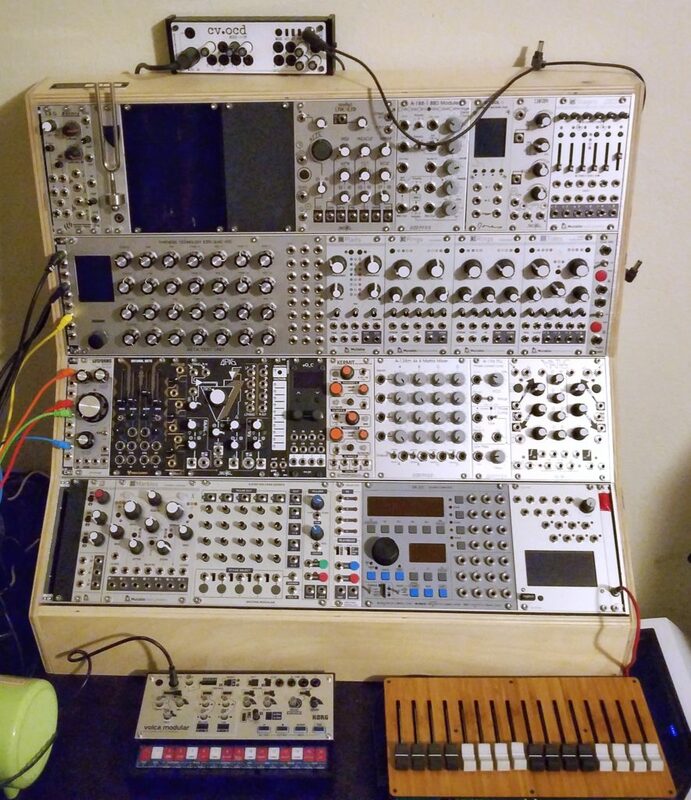 My hope is to put the new Eurorack case on the right side. The shelf I’ve got there now is a little too short to work with it, so that’s either getting swapped to the left — mounted on the back, jutting out toward my head — or getting repurposed elsewhere. The pedals are still a question. I had hoped to put them atop the Euro case, but it’s about 2.75″ front-to-back up there and that’s not a lot. 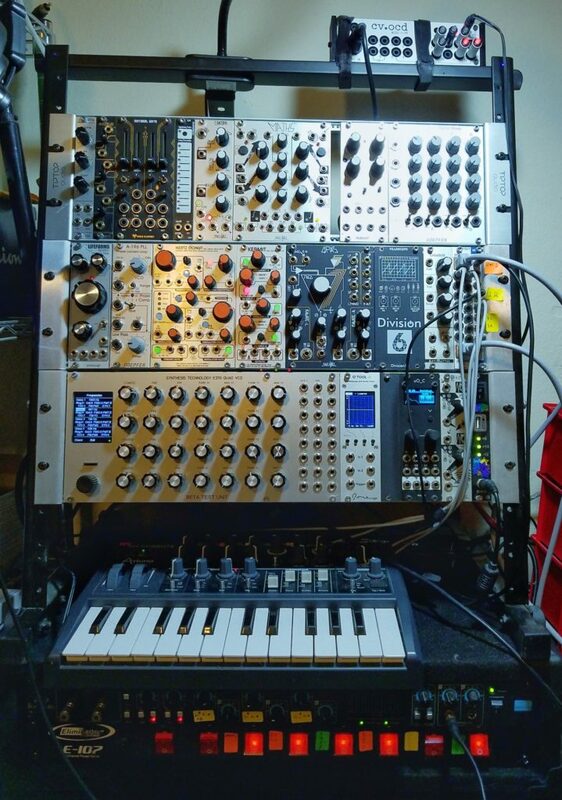 Perhaps I can rig up a slightly deeper shelf with rubber feet to sit atop that, for the pedals to perch on — but I worry if they’re not secure they could come crashing down on top of my modular. So maybe they’re going to the left side. To make a little more clearance for the Euro case I’ve got a smaller pair of computer speakers on the way — I always use headphones for music production anyway, so they’re really just for games and movies. And now I just realized I forgot to get the adapter cable I’ll need for the audio interface. I was the third of three drummers for a high school heavy metal band. Like, an official class, taught by the guy who had taught the school’s jazz ensemble in real life. And just like the jazz ensemble in real life, we were really not good. Throwing books at Hitler, while he sat for an interview with an NPR reporter. Nice hardcover editions of The Sandman graphic novels. I’m not sure if Neil Gaiman would approve, or would suggest I find something else, but it was effective — The Kindly Ones really took a chunk out of his arm, messed up his uniform and completely disrupted the interview. And speaking of relaxation, I have found that while the nasty-tasting CBD oil helps my anxiety and mood, the capsules I bought from a different company (at a higher concentration, even) just don’t do very much. I must be carrying a lot of tension in my back muscles just from the anxiety, because switching back to the oil for a day relieved a knot that had been bothering me for a week. And here I thought it wasn’t doing that much to help physical pain. Hopefully I can find an option that is less yucky, but still effective. In local music news: those thoughts about an “acoustic universe” — and maybe watching season three of The Expanse — led to a general concept for the next album. The working title is Passing Through, as in both travel and permeation. I’ve got four candidate songs in place now and one rejected, all coming from experiments with QPAS, ER-301, and the Volca Modular. The VM is a fascinating and sometimes frustrating little beast. It’s rough around the edges and has a lot of limitations, compared to Eurorack modules or software. Some of those are the “do more with less” kind which encourage creativity; some give it character; some are just annoying. But overall it’s pretty amazing for such a tiny, cheap synth. My new case arrived, and I was eager to get moved into it but my spouse wisely pointed out that it’s probably better to burn it — that is, in the sense of pyrography — before loading it up with fancy electronics. Okay, that makes sense. 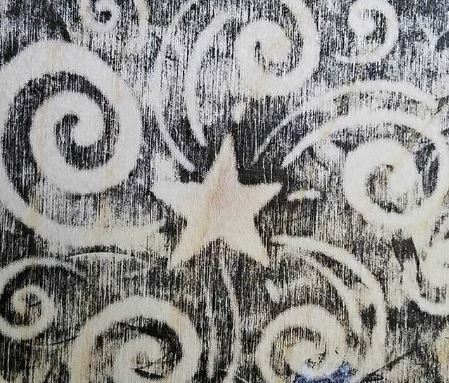 🙂 I spent a few hours poring over clip art and tattoo designs of stars, meteors and black holes for inspiration; she spent a day or so working up a rough draft design in a paint program. I think it’s going to be pretty spiffy and I’m eager to see the results! I begin with a digression, because I must share this. I mean. 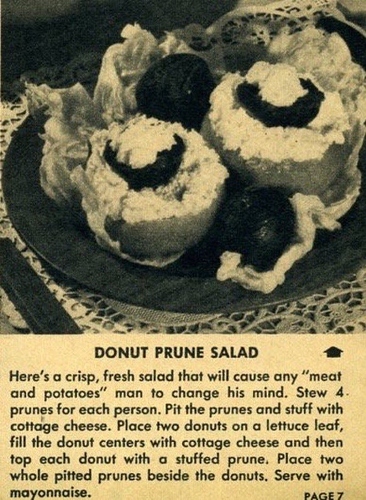 Once you have combined the concepts of “donut”, “prune” and “salad” into a single dish, why not serve it with mayonnaise? What gets me here is the apparent random anarchy of the ingredient choices, paired with the strictly limited, generic, whitebread pool of possible ingredients that must have been drawn from. There are no spices or seasonings, nothing that would indicate a culture — except we all know it’s got to be “American, white, 1950-1975.” It’s almost mechanical, like it was created with a very crude randomization algorithm that lacks the finesse and charm of a neural network recipe. 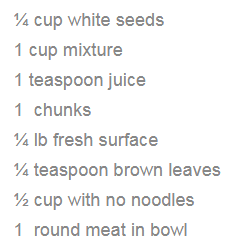 I appreciate how this one (brown) leaves certain factors — not least, all of the actual preparation instructions — up to the cook’s improvisational judgement, so that each performance is unique. John Cage would approve. 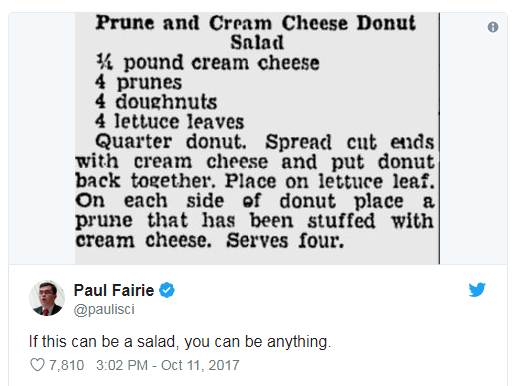 Maybe the weirdest thing about the donut prune salad recipe is that it’s not unique. Coincidence or conspiracy? The aesthetics of the first one, such as they are, seem a little better but I’d honestly rather 86 the mayo and use cream rather than cottage cheese. I’d also rather break my left arm than my right arm. Anyway, what I was going to write about: I’m currently reading DJ Spooky’s Sound Unbound: Sampling Digital Music and Culture and it’s thrown some provoking thoughts my way. One of them is the idea that our primary mode of thinking is a visual/spatial one, with a coordinate grid, objects that take up space, and the spaces between them. The argument is that this spread in Western thought during the Renaissance with Descartes, the printing press, explorers and maps, etc. It’s probably not much of a stretch to say that movies, television and computers were heavily influenced by, but also strongly reinforced, this spatial paradigm. It all seems very rational, scientific, and straightforward. Of course, it’s pretty wrong and/or useless at the quantum level, or when considering energy, or for a lot of metaphorical or magical uses, but it’s pervasive and sometimes we try to make things fit anyway. My career has been based on it — 3D graphics and modeling for games and then engineering. I will speculate with some confidence that the previous mode of thought for most people for most of human history was a bit less spatial and more narrative. When we say “myth” now, unfortunately there’s usually a connotation of falsehood, disdain for the primitive etc. rather than the understanding that the idea of truth itself wasn’t necessarily so fixed and binary. But steering a little more toward the inspiration from the book: the idea of an “acoustic” mode of thinking, where the measurement of space is more vague, and reality is inhabited by an infinity of interpenetrating fields of energy and motion, pressure and density, transmission and absorption and reflection. There are no distinct “objects,” just a whole where any divisions one makes are arbitrary slices of a spectrum that we know we could have sliced up differently. This ties back into what Curtis Roads was talking about when he claimed electronic music removes dependency on notes. Amplitude over (a very short) time; literally the path the speaker cones will trace, sending waves of pressure through the air but also through wood, water, metal, bone, brick (not very well) etc. Intensity represented by brightness/color, with the frequency spectrum on the vertical axis and a span of time on the horizontal; we see a note or chord as a series of stripes, and notice that higher frequencies fade away faster than lower ones; there’s some intrusion of broadband noise in the middle. 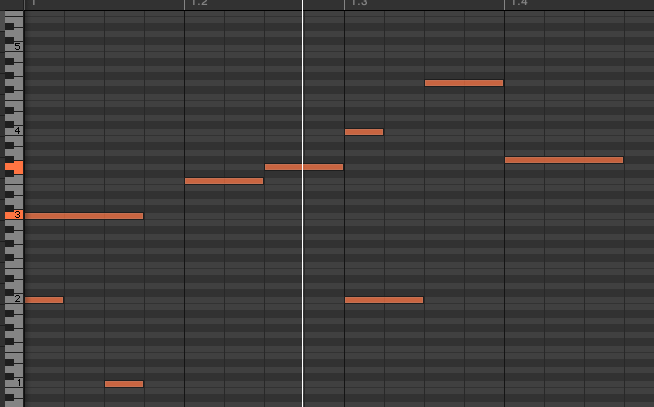 This rhythm generator is even called Grids. This is a Monome Grid, a button/light controller with many different software- and hardware-based friends, often used for music sequencing. 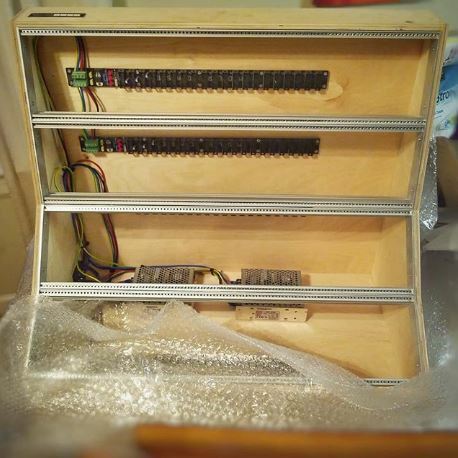 And this module is named for Descartes and is referred to as a “Cartesian sequencer” due to its ability to navigate in two or three dimensions, as opposed to linear sequencers which navigate either forward or backward but are still, conceptually, grids. 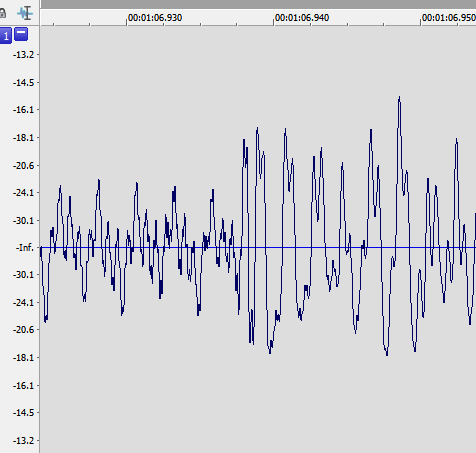 Using some of those grid-based tools above, I did some editing this evening of a recording I’d made earlier. There was a point where a feedback-based drone fell into a particular chord, which I thought made a much nicer ending than what happened later. So I took a bit of that ending, ran it through the granular player in the ER-301 to extend it for several seconds, resampled that and smoothly merged it back into the original audio — one continuous drone. No longer two things spliced, nor five thousand overlapping grains of sound; those metaphors stopped being useful, just like eggs stop being eggs when they’re part of a cake. 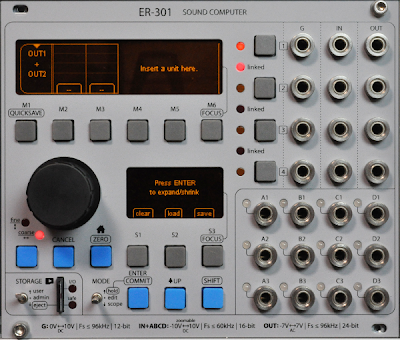 So the ER-301 is pretty brilliant. 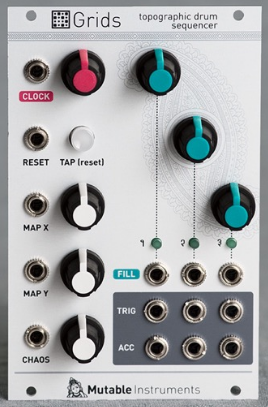 It arrived Thursday, ahead of the estimated arrival, and I’ve spent several hours learning to navigate it, building up a few custom units (such as a complex oscillator and a wavefolder), experimenting with its delays and loopers and feedback and so on. 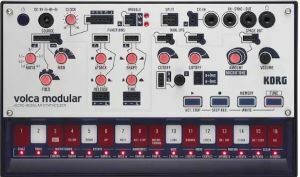 It’s essentially a software modular system (where the modules are “units” which form “chains”) inside of a hardware modular system. 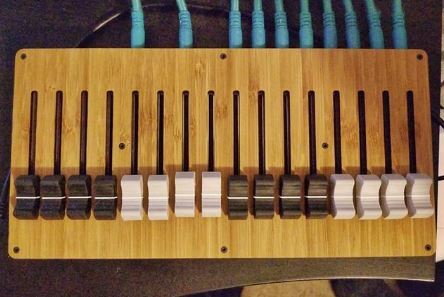 With four audio outputs and 20 audio or CV inputs, as well as accepting up to 100 simultaneous control values and triggers from the Monome Teletype over an i2c connection behind the panel, it has plenty of ability to integrate with everything else. It’ll happily do some things I can’t achieve otherwise. It’ll do other things more simply, or with much greater flexibility and control, than equivalent modules, or in parallel with them. 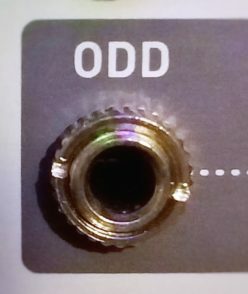 There are some things it can do but with less hands-on-instrument-feel than equivalent modules — some of which will be improved by the Faderbank (likely arriving today or tomorrow), and some are probably best left to other modules. It’s got a learning curve — several of them, in fact — and documentation is incomplete and sketchy. There are some excellent tutorial videos, a helpful forum, and a somewhat helpful wiki, but the purpose and applications of some of units are still kind of a mystery. 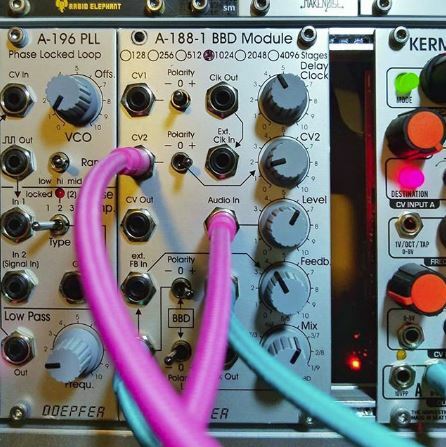 I would never recommend this module to anyone inexperienced in modular synthesis, nor anyone without a really solid handle on theory, or who is even a little bit uncomfortable with computers. While I know I need to explore its sample slicing capabilities a bit more, it really doesn’t seem as easy as Maschine’s or as precise as Sound Forge. But it’s adequate to certain uses for the feature, and for everything else, I can transfer to the computer via SD card. One of the most fundamental utility units, the Mixer Channel, really could use a variant that just takes an input from leftward on the chain instead of an assigned input. I should be able to build that myself if I learn just a little Lua. Overall, it’s incredible. I went ahead and put my Hertz Donut and Chronoblob up for sale, confident in their replacement. I’ll keep the Kermit at least for now, because I’ve been unable to identify what makes its character with complete confidence, and my attempts to replicate it have been… interesting and useful but not close. Kind of like the story of Post-It Notes being invented by a chemist trying for a strong adhesive. Last weekend I also sold the last of the previous batch of modules, and ordered the Volca Modular — the wee, mad, fierce, Nac Mac Feegle of synthesizers. I’ll wait to sell more stuff before grabbing the Erbe-Verb or anything else, keeping up with my goal of offsetting gear purchases with sales.